It was a cold, wet winter when Brauni set out to find a new place to live. He just didn’t feel happy in the city anymore. His biggest dream was to begin a new life in the mountains. 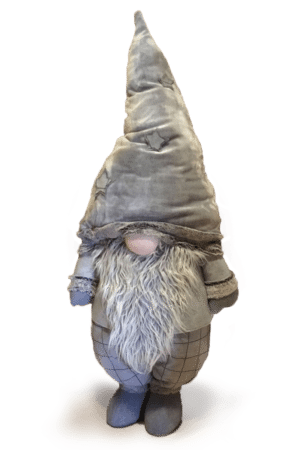 Equipped only with a small rucksack and a few slices of bread, the little gnome trod off into the big, wide world. After hiking for days, in the Pongau region he suddenly came to a small, remote forest. Bravely, he pushed his way through the branches and bushes, until he unexpectedly encountered a forest sheep with funnily twisted horns: “Welcome to our paradise! So, who are you then?” “I am Brauni, the gnome. Do you know a special spot in the forest where I might make my home? It is so beautiful here, I absolutely want to stay, if you will allow me to.” The mouflon nodded and trotted off with Brauni following. Suddenly they came to a small clearing, where the first animals were already gathered, curious to meet the new arrival. Wow, it was simply so beautiful here! Brauni’s eyes lit up, and when the last deer arrived at the clearing, he couldn’t restrain himself from exclaiming with joy: “Dear inhabitants of this magical forest! After my long journey, I have finally arrived – in future, this shall also be my home. I have an idea: If you help me to build a hut I can live in, you will always be able to find shelter with me. If the cold ever freezes the streams or the heat should get too strong, then my home will also be yours.” And so it was – all the animals of the forest helped the little gnome to build his so-called “Braunegg Alpe”. Wood was collected and even a spring was discovered in what would become his future garden. The final result left nothing to be desired, and tears of joy rolled down Brauni’s cheeks. He thanked each of them with a sincere embrace. Over the years, he realized that it was a shame to keep this wonderful place purely for himself and the animals. He wanted to make it possible for people like you and me to find a little piece of happiness and contentment here, too. And so it was that more and more people gradually found their way up to his remote hut. He was delighted by every visitor, and especially the children. And it is said that, even today, the little gnome Brauni still scurries around at his alpine hut in Ski amadé. If you look closely, you might also catch sight of him smiling, as soon as the door opens and his new friends eagerly enter his magical world.